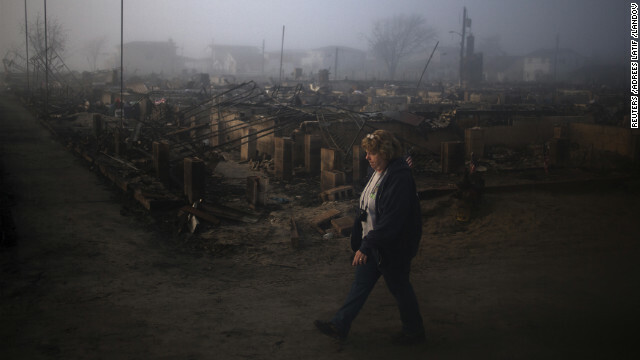 A Breezy Point resident walks past burnt houses after the neighborhood was left devastated by Hurricane Sandy in the New York borough of Queens November 12, 2012. Editor’s Note: John and Bonnie Nystrom are the authors of “Sleeping Coconuts,” the true story of how a devastating tsunami changed the face of Bible translation in Papua New Guinea. (CNN) - As images of the Superstorm Sandy's devastation have filled our TV screen and computer monitor these last three weeks, our thoughts have often been of friends in Arop, a tiny fishing village in Papua New Guinea. When it became clear that Hurricane Sandy would hit the Northeast United States hard, our thoughts went back to our friends in Arop, a tiny coastal community that faced an unimaginable tragedy of its own. In July 1998, earthquakes off the Pacific island's shore sent three 30-foot waves roaring toward the coast. Most of Arop's huts were built on stilts, but they never stood a chance against such a force of nature. The tsunami destroyed everything and claimed the lives of more than a third of the 2,400 people who called Arop home. Whenever a natural disaster makes the news, we think of them. Before the tsunami we had worked among the Arops for 10 years as linguists with Wycliffe Bible Translators. Our mission was to translate the Bible into their language, which previously had no written form. Because we lived and worked in a community that overcame such inconceivable tragedy, people often ask us how Christians “keep the faith” in the wake of tragedy. Unfortunately, we usually wait until after disaster strikes to determine how we will respond. It is very difficult to think clearly about God, or anything else, when your world has been turned upside down. God never promises any of us a trouble-free life. The world we live in is far more troubled than many of us realize. As difficult as it can be, we should not see tragedies as faith-shaking events, but as opportunities. When the 1998 tsunami hit our Arop friends, we weren’t wondering where God was. He was where he always is: in sovereign control and with a much bigger purpose than we could ever conceive. As we returned to Arop immediately after the storm hit to help our organization fly in supplies and fly victims out, we also started to think differently about the monumental task of creating a written form of the Arop language and helping them translate Scriptures into it. Papua New Guinea is home to over 800 languages. The disaster gave us much greater compassion for other language groups nearby that still had no Scripture in their language to go to for comfort. Their traditional religion lacked a category for innocent suffering so it offered no way to explain or cope with such a tragedy. With the Arop-speaking translators we had trained taking the lead, we formed a community of translators with church leaders from 10 neighboring language groups who also wanted to translate the Scriptures into their languages. Together we developed a team approach to translation that proved to be more efficient than our pre-tsunami single-language approach. This method has revolutionized the way Wycliffe approaches translation in that region, but we never would have considered it if not for the tsunami. Our faith and the faith of those around us can be strengthened in a crisis if we choose to see it as an opportunity to rethink what we’re doing with our lives and how we can be more effective in serving others. The opinions expressed in this commentary are solely those of John Nystrom and Bonnie Nystrom. Anyone find fossils of Adam and Eve yet ? Probably the gais right? Better go all Word of God on them. Disgusting people. Just like Tebow threatening the children in his orphanages with hellfire and damnation if they don't believe in "the one true savior". Pedaling myth as fact is just plain wrong and doing it to people while you hold food-aid or some other close item they may need in-hand is the worst, classically evangelical thing to do. Disgusting. You want to do some good? Screw the bible translation and help them keep up their infrastructure, pick up a shovel and dig fields and plant food ya danged freaks. Storms are caused by nature, nothing else, and teaching them the facts instead of fictions is REAL help. Evangelicals are disgusting. Fundies, helping us create atheists since 1 A.D. Hint: this is bad thread to be rubbing "prayer works" into the faces of people who just lost everything and likely prayed the opposite. "Before the tsunami we had worked among the Arops for 10 years as linguists with Wycliffe Bible Translators. Our mission was to translate the Bible into their language, which previously had no written form." Instead of giving/teaching them something useful like not living in tsunami- prone areas !!! "pervert alert" is the degenerate. This troll is not a christian.'. The statistical studies from the nineteenth century and the three CCU studies on prayer are quite consistent with the fact that humanity is wasting a huge amount of time on a procedure that simply doesn’t work. Nonetheless, faith in prayer is so pervasive and deeply rooted, you can be sure believers will continue to devise future studies in a desperate effort to confirm their beliefs. I'm sorry, "Atheism is not healthy for children and other living things", but your assertions regarding atheism and prayer are unfounded. Using my Idiomatic Expression Equivalency module (IEE), the expression that best matches the degree to which your assertions may represent truths is: "TOTAL FAIL".